You have heard all of your friends rave about the wonders of air fryers for a long time now, so you finally went out and bought your first one. Now all you need to do is figure out how to use an air fryer. Not to worry, these are some of the simplest and most effective small cooking appliances on the market. To help you get the most out of your new cooking toy, we developed this quick article on how to use an air fryer. If you have not yet purchased one, you may be unsure of exactly what an air fryer is. Even if you do have one, you are probably uncertain as to how they actually work. So before we get into the details of how to use an air fryer, let’s spend a moment on how they work and what makes them a great alternative to other traditional cooking methods. Most air fryers cook through a process known as “rapid air technology.” This is a fancy term that basically means it cooks with hot air. 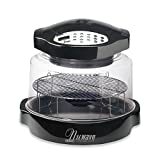 It heats up quickly, builds up pressure and circulates the air around the food to ensure it cooks evenly. By rapidly circulating this superheated air, the air fryer will surround your food with heat and provide that crisp, crunchy texture you love without the oil required in traditional fryers. This provides a healthy alternative to traditional frying while not losing out on any of the taste of french fries, fried chicken, onion rings or any other fried favorites that normally contain many more calories. So now that we now that we know how it works and why it is preferable, here is how to use an air fryer. Your fryer will include a set of instructions and probably a cookbook, but these are the basics that will be required with all foods. We know, air fryers are supposed to provide a method of cooking without oil, but this is only to keep it from sticking to the basket and ensure it is properly cooked. Hence, the small amount of oil. Air fryers consist of a metal basket that fits into the main chamber and hold the food while it cooks. This is pretty self-explanatory. Some air fryers have manual timers, but many are now digital. The more expensive ones even have touch screen timers and displays. Either way, they all work the same. The time will depend upon the food, so consult your fryer’s instructions or the recipe book. Enjoy your crispy fried food! Unlike traditional frying methods, air frying is better for health because of no excess oil to drip or soak up. Any oil will have dripped into the pan of the air fryer, so you are ready to eat!